These make wonderful edible gifts if you can bear to part with them! Get the kids involved with weighing everything out, naming ingredients they may be unfamiliar with. They will especially love the melted chocolate swirling (and licking) part! *This recipe makes 30 pieces. 1. Preheat the oven to 180°C/gas mark 4. Grease a 24cm x 30cm baking tray with a little sunflower oil and line with non-stick baking paper. 2. Place the honey, stem ginger, coconut oil and vanilla extract in a small pan. Simmer over a low heat until melted together, then remove from the heat. 3. Mix all the dry ingredients together in a large bowl. Pour the syrup mixture over and stir together until evenly mixed. Tip out onto the prepared tray and spread evenly, pressing it down well. 4. Bake in the oven for 12 to 15 minutes. The bark will still feel soft, but don’t worry, it will harden and crisp up as it cools. Remove from the oven and use the paper to lift it out of the tin. Leave to cool for at least 30 minutes, still on the paper. 5. Meanwhile, snap the dark and milk chocolates into pieces in a small heatproof bowl and put the white chocolate in a separate bowl. Melt in the microwave in 30-second blasts, stirring between each go, or set over a pan of simmering water, making sure the water doesn’t touch the bottom of the bowl. Stir each until melted, then leave to cool a little. 6. Place a large piece of non-stick baking paper on a work surface and carefully turn the bark over onto it. Peel away the original paper and discard it. Spread the dark and milk chocolate mixture over, then immediately drizzle the white chocolate on top. Using a skewer or a teaspoon handle, swirl the white chocolate to create a decorative feathered pattern. Sprinkle the cranberries over evenly. 7. Chill in the fridge for 30 minutes, until set firm. Break or cut into about 30 shards and serve. Any remaining bark can be stored in an airtight container in the fridge, layered between pieces of parchment paper. 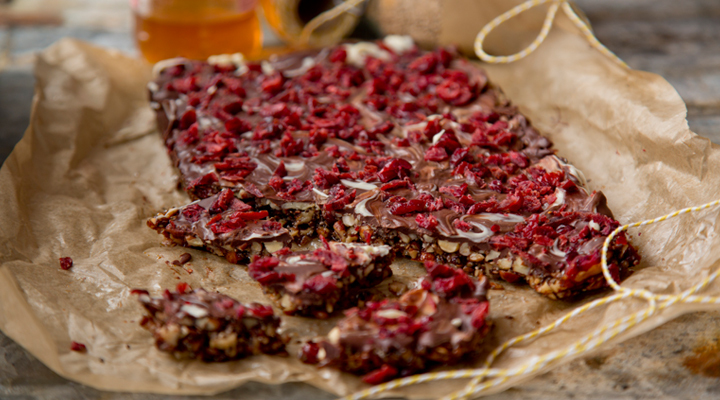 For a healthier version, make the bark without any chocolate, adding the cranberries directly into the bark mixture if liked. For some added festive cheer, why not scatter edible sprinkles over the chocolate? Choose from Deck the Halls, Snow Drift, Let It Snow, O Christmas Tree, Poppy Red or Jingle Bells in the SugarCraft range.